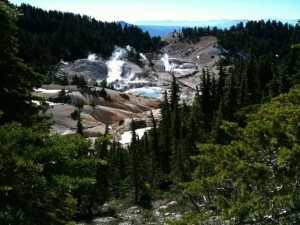 This morning we started our hike to Bumpass Hell at 8:00 am. The area of geothermal activity is the namesake of the somewhat unfortunately surnamed Bumpass, who fell into some boiling water and lost a leg. 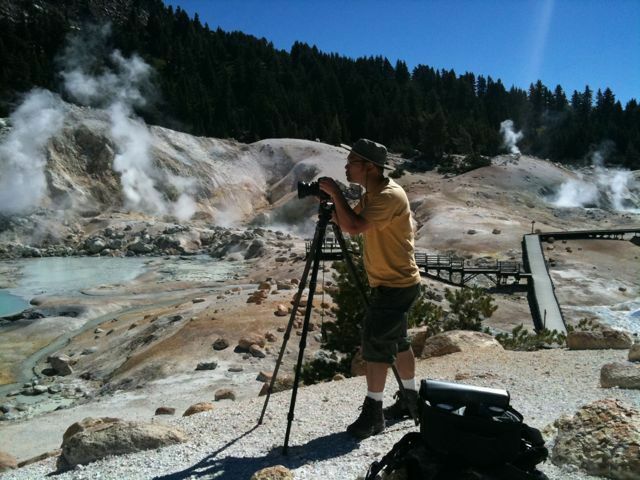 The hike to Bumpass Hell takes about three hours round trip, although for us it is longer because of photography time. Because it was still cool when we started, the snowy sections were quite slick because of so many people trampling on them. There was one section that was kind of steep and very slippery and I decided to try sliding in a crouch a bit, but it didn’t work that well. I dreaded coming back up that hill, and wished I had remembered to bring my walking sticks on the hike. 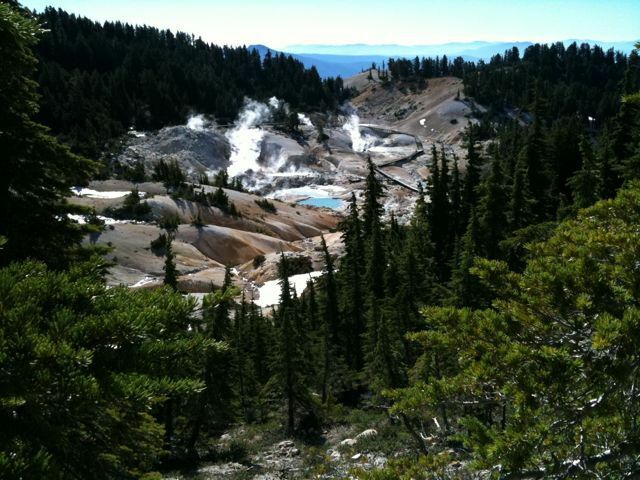 When we reached Bumpass Hell, we were the only ones there at first, but we stayed long enough that other people began to show up. The boiling sulfurous water was really amazing. All the signs said that several people were seriously burned every year because they didn’t stay on the raised platforms. What kind of idiot gets off the platform when the nearby water can be as hot as 300 degrees F? Stupid. 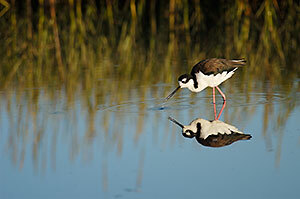 I had no interest in getting any closer to the water. When we headed back up, the snow was mushy enough that we didn’t have any problems. We encountered tons of people heading down as we were heading back up, including a bunch of Boy Scouts. Stephen walked down to a rather precarious spot to take a shot of the whole Bumpass Hell area, and took a muddy spill on his rear end. Luckily, both he and his camera equipment were okay. We got back up to the parking lot at around 11:15 am and I made lunch while Stephen cleaned up his tripod, camera bag and rear end. Then we headed toward Lake Manzanita so we could fill up on gas and buy some ice. On the way there, we stopped at Lake Helen for Stephen to take some pictures. Stephen drove to Lake Manzanita and I could barely keep my eyes open. After Lake Manzanita, we left the park and circled around it to the North and re-entered in the northeastern corner, heading to the Butte Lake campground. We got here around 2:00 or 3:00 pm and selected a camping spot. While Stephen set up the tent, I walked to the ranger station and dropped off the envelope with our money for the campsite. It was only $16. We had already paid $18 for the space down at Mineral Lodge, but both sites together were still way cheaper than a motel room. Then I checked out where the trailhead was for the Cinder Cone hike. After relaxing for a bit, we hiked about a mile up the Cinder Cone trail, just so we could get an idea of the hike in advance. The hike up the Cinder Cone itself looked very steep. But we plan to get up at 4:00 am tomorrow so we can be at the top for the sunrise, so the hike won’t be hot. 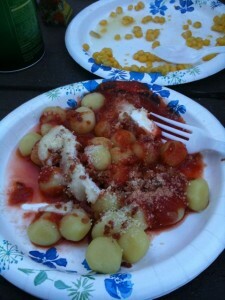 For dinner tonight, Stephen made gnocchi with tomato sauce and Brie, with a side of sweet corn, using our little camp stove. It was delicious. The only problem we’ve had has been that Stephen has had about three bloody noses this afternoon. I guess the dry air doesn’t agree with him. It’s starting to get chilly, so we are going to brush our teeth and head to bed.